This Sunday is the big game and that means lots of appetizers and wings to snack on. We’re going to be grilling some hot wings, and making some jalapeno poppers. 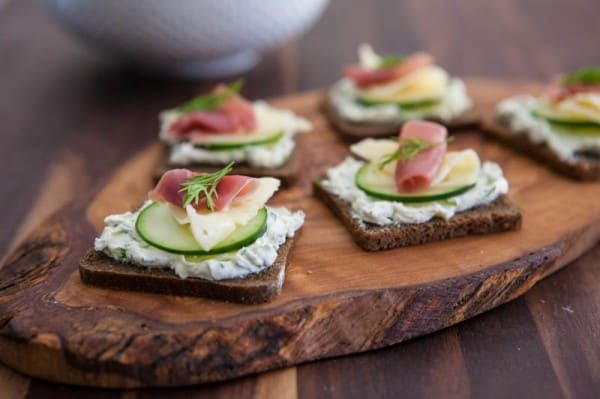 But to start, I’m going to make a few little appetizers for us to snack on like these little prosciutto, Swiss and cucumber appetizers. These are so simple to make, You just start with party rye, or pumpernickel like I have used here. Then spread on some cream cheese infused with fresh dill. 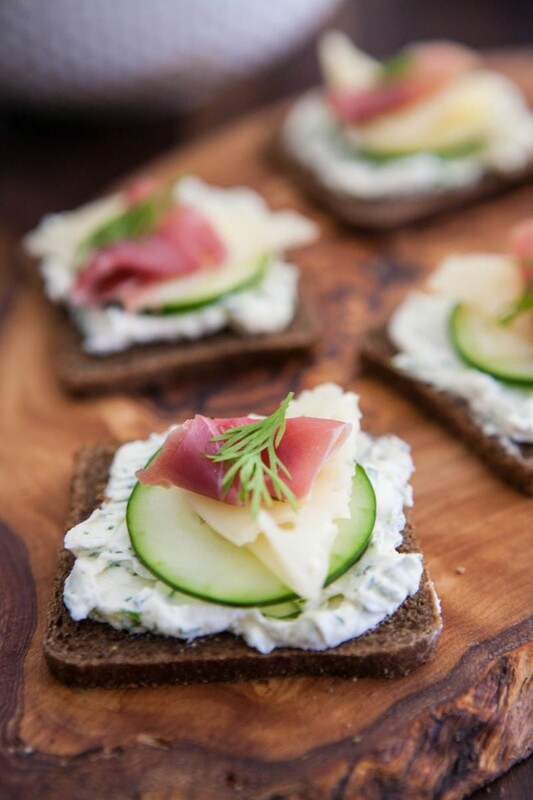 Then just layer on a crisp slice of cucumber, some creamy Swiss cheese and a piece of Prosciutto. To finish these, I added a sprig of fresh dill. It makes these beautiful and tasty. For these appetizers I used my new favorite Swiss cheese, Lorraine. This premium specialty cheese has a delightfully creamy flavor and a lacy, light texture that stacks beautifully on deli platters, heroes, hoagies and crackers. And at only 75 mg per serving, Lorraine® cheese is naturally low in sodium but still deliciously full-flavored. You can find Lorraine cheese in pre-sliced packages or sliced to order from the deli counter. 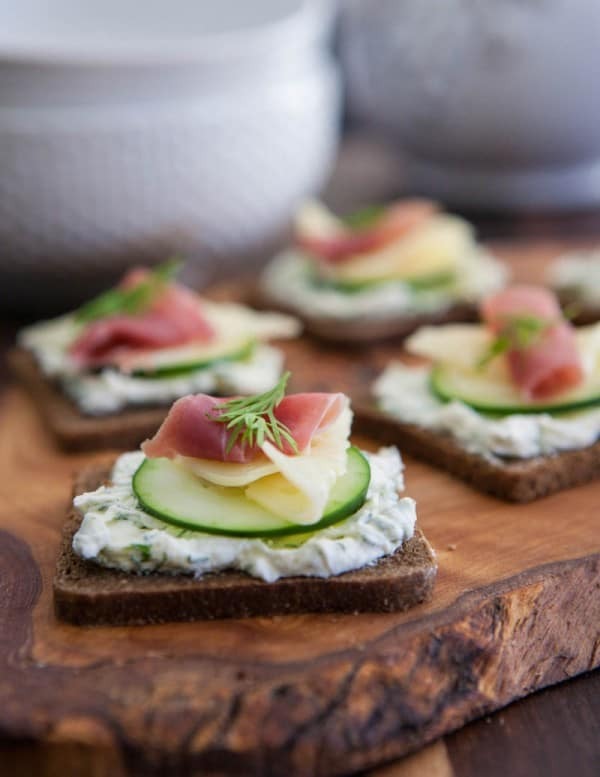 Combine softened cream cheese and fresh dill in a small bowl. Mix well to combine. Spread cream cheese mixture on party bread. Top with a slice of cucumber, a slice of Lorraine Swiss cheese and a piece of Prosciutto. Garnish with a small sprig of fresh dill. I’m going to take the whole plate. M’kay? I could eat this all for lunch! Love it! I’ve been having a hard time finding some delicious (and healthy) recipes for the Super Bowl this weekend, but these are perfect. Thanks for sharing! These look excellent. A little salty, a little creamy, a lot of delicious! Like Tess said, delicious and healthy!